In their recently published Letter in Journal of Physics A: Mathematical and Theoretical researchers from the University of Adelaide have provided a topological classification scheme for generalized Weyl semimetals. 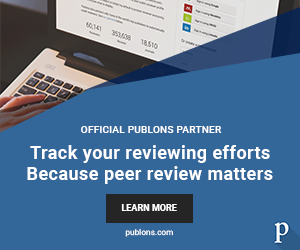 They talk to JPhys+ to tell us more about their research. This Letter has been selected for the 2017 Highlights collection. Mathai Varghese holds the Elder Chair in Mathematics at the University of Adelaide. He is a Fellow of the Australian Academy of Science, and the Director of the Institute for Geometry and its Applications (IGA). Guo Chuan Thiang holds an ARC DECRA postdoctoral fellowship at the University of Adelaide and is a member of the IGA. 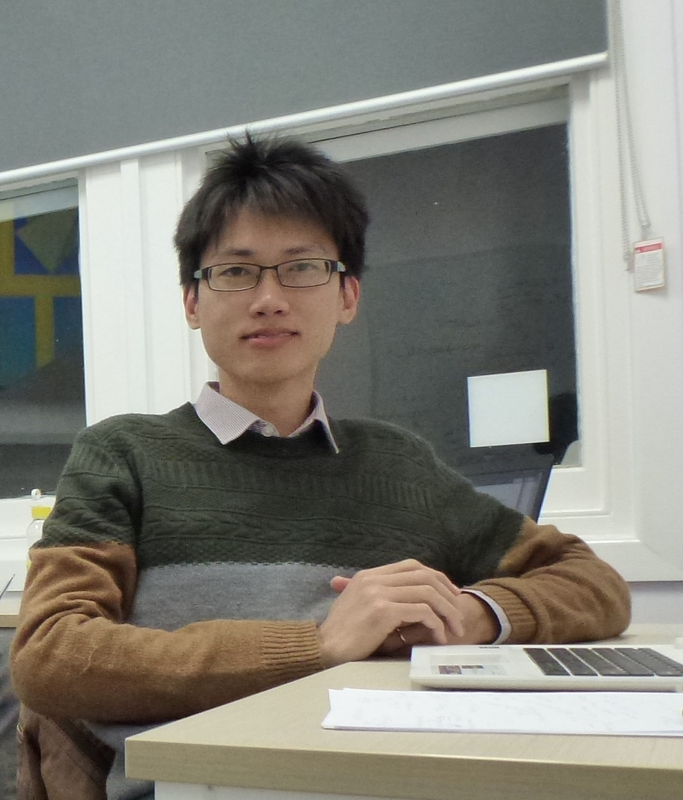 We have been working together on condensed matter physics for the past couple of years when Guo Chuan arrived from Oxford University to Adelaide as a postdoctoral associate in January 2015. We initiated the use of T-duality in String Theory to study topological insulators, and just last year, we studied Dirac-type Hamiltonians associated to vector fields and used local and global topological invariants of these vector fields to study topological semimetals in 3D, where an extension problem for line bundles is also solved in our J Phys A Letter. The experimental signature is that of Fermi arcs, which are shown to be homological in character. 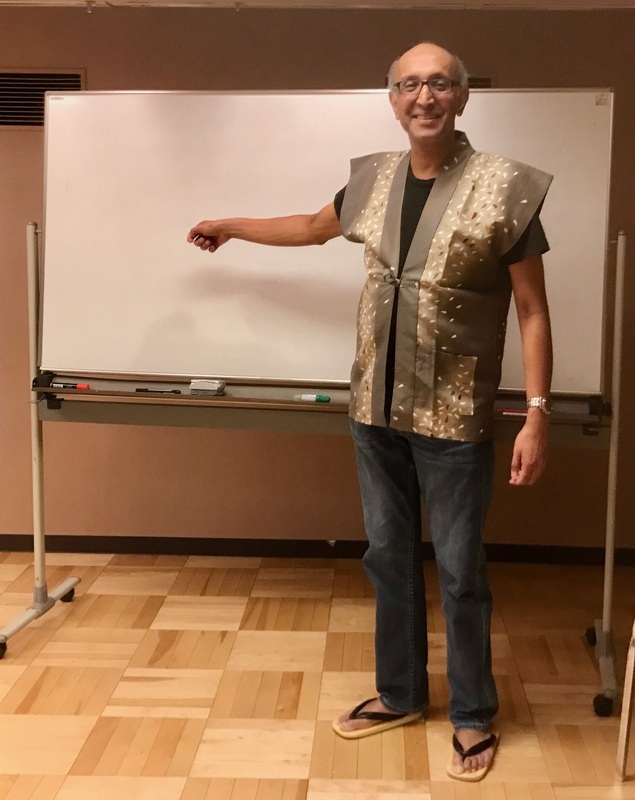 This paper is in the area of topological matter where the 2016 Nobel Prize was awarded. It provides a rigorous topological classification of generalised Weyl semimetals in arbitrary dimensions. In particular, electron motion in a crystalline material is described by a periodic Hamiltonian H acting on 3D Euclidean space. The Bloch-Floquet transform turns H into a smooth family of Bloch Hamiltonians H(k) over the Brillouin torus. One typically studies the restriction of H(k) to a finite-rank low-energy subbundle S, using the same notation. For example, (2×2) traceless matrices H(k)= h1(k)p1 + h2(k)p2 + h3(k)p3 for some vector field h(k) = (h1(k), h2(k), h3(k)), over the Brillouin torus, where p1, p2, p3 are the Pauli matrices. Then H(k) has spectrum +/-|h(k)| . If the vector field h(k) has no zeros, then we are in the case of the leftmost diagram of the figure below describing topological insulators. Generically the vector field h(k) has isolated zeros, called Weyl points, as in the case of the rightmost diagram below describing topological semimetals. Here the green band is the conduction band and the red band is the valence band. Figure describing topological insulators. The green band is the conduction band and the red band is the valence band. A natural question is: can a semimetal be perturbed into an insulator as imagined in the figure below? The perturbation of a Weyl semimetal into an insulator. This is not just a matter of modifying the spectrum of H(k). There are both local and global topological obstructions to modifying H(k) in order to open a gap, so semimetal band structures can be rather robust. The local topological obstructions are the local indices of the zeros of the vector field h(k) that can be identified with the the Chern numbers c of the valence line bundle restricted to small spheres surrounding the zeros, and the global constraint is that the sum of local indices add up to zero (Poincare-Hopf theorem). The Nielsen-Ninomiya requirement is reduced to a vanishing condition in a Mayer-Vietoris exact sequence of cohomology groups. The mathematical framework also sheds light on the bulk-boundary correspondence and the stability of Fermi-arcs connecting Weyl points in their boundary projections. It identifies the Fermi arc invariants with elements of a relative homology group. The authors argue that there may be globally inequivalent band structures/Fermi arcs, which nevertheless have the same charges at the Weyl points. 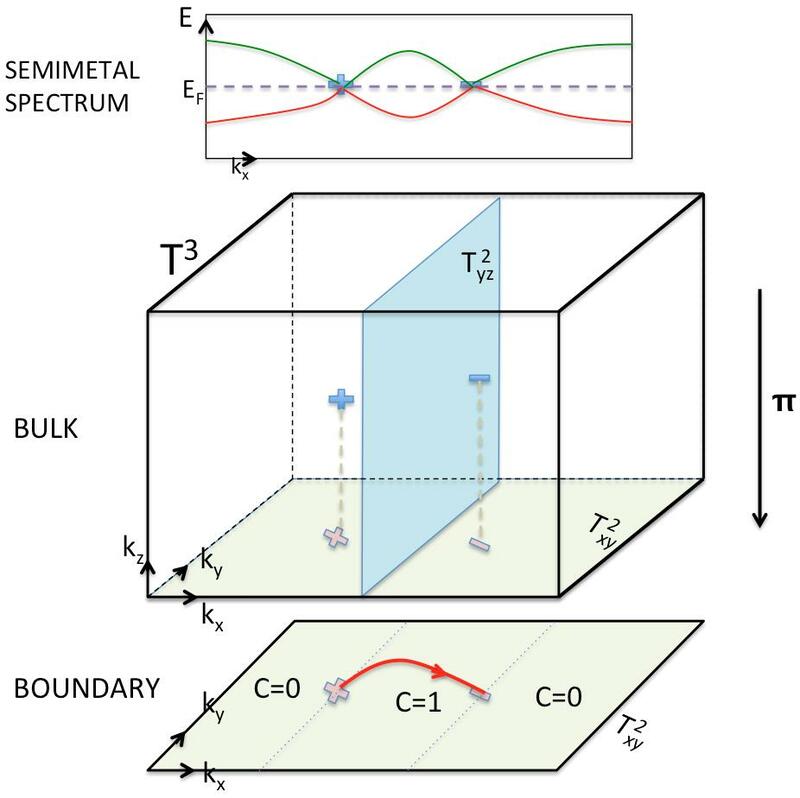 Figure showing the Bulk and Boundary effects along with the corresponding semimetal spectrum. We have generalised the results in our J Phys A Letter, where gerbes (higher analog of line bundles) in 4D and quaternionic line bundles in 5D appear in the analysis. In the same paper, we go beyond Dirac-type Hamiltonians and introduce new classes of semimetals whose local charges are subtle Atiyah-Dupont-Thomas invariants globally constrained by the Kervaire semicharacteristic, leading to the prediction of torsion Fermi arcs. Guo Chuan Thiang image owned by Guo Chuan Thiang used with permission, Mathai Varghese image used with permission. Copyright IOP publishing, all rights reserved to images.